•Make sure your boat is legal with this U.S. Coast Guard approved throwable cushion. 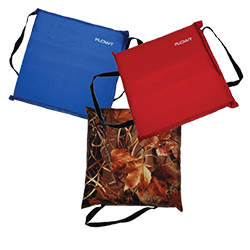 •Convenient webbing grab straps aid in throwing and double as carry handles. •Functional and comfortable PE foam. •Strong, durable outer shell withstands abrasions. Available in red, blue, or camo.